Today we took it outside and played with colorful water. Because I didn’t want my toddler (“J”) to squeeze an entire vial into a small cup and then immediately dump it on the ground, I put them up on our fence and was personally in charge of adding them as needed. This was a great way for him to practice the names of colors: “Green! Blue! Yellow!” For some reason, he never asked for red. This was definitely messy and wet. I brought out the garden hose and turned it on very low so J could use it himself without getting very wet and we weren’t wasting a ton of water. To be honest, I think J would have been just as happy with the water alone, but the food coloring made for a fun change of pace. Dress yourself and your child for the possibility of getting wet. It’s best to do this on a relatively warm or hot day. 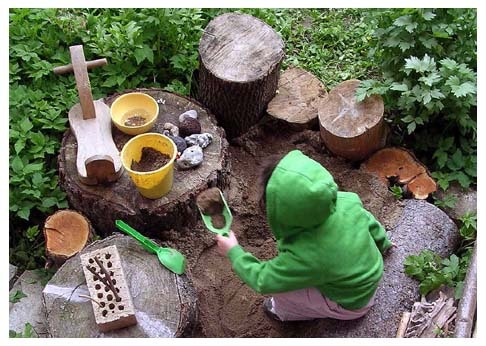 Collect your containers and utensils, and set up a play area in a place that is accessible to your water source. Put some water in some of the containers, add a little food coloring, and have fun! If you have a yard, one of the best toys you can put in it is a sandbox. Kids can spend hours in the sandbox almost any time of year. A little rain only makes it more fun! Never wanting to be traditional, I didn’t want a sandBOX. I wanted to create something myself that would meld into nature and would allow my toddler (“J”) to play in it along with the rest of the yard — not as a separate entity. Tree stumps, a marooned boat, big shovels, huge space — what’s not to love? It turns out that tree stumps are super heavy — ha! Who would have guessed? We were lucky enough to find a neighbor with a tree that was recently cut down, but even though they had some amazing stumps, it was impossible to take the really awesome, really huge ones. We took the ones we could manage to haul away. Enter the second challenge — cutting tree stumps! I am notoriously bad about cutting myself with even the smallest knives or scissors, so I wasn’t about to get near a chainsaw. My dear husband kindly cut the really rough edges and used his power sander on the stumps, and that was as much as we could do. I’d love to have a few more stumps and have them at some different heights than these are, but they provided a good enough barrier and a nice workspace. After some digging and lots of sand-dumping, we have ourselves a sandbox to dig in! Get as many of the materials as you can for free. I love the look of natural items, and they can force you to be more creative in order to make them work in your space. Although they were hard to move, the tree stumps we got for our sandpit really make it. Dig into the space where your sand will go to avoid having to dig too deeply for your stumps. I found it easiest to dig a shallow hole for the sand and pile the dig around the stumps, rather than try to dig very deeply into the ground to stabilize the stumps alone. Our space had a lot of big tree roots close to the surface, so it was impossible to dig very deep. Don’t underestimate how much sand you will need. I ended up using 20 bags of play sand from Home Depot, and I think it would be ideal if I added another 4-5 bags on the top. If you can get your sand cheaply through bulk delivery, it might be worth it. Make a plan for covering your sandpit after you are finished. I’m temporarily using a tarp and some landscaping fabric, but it’s not a perfect solution. Since our trees are dumping piles and piles of leaves right now, it’s essential to cover the sandpit. Furthermore, you don’t want cats and other animals using it as a litter box.